The following morning Richard picked me up pretty earlier for out first official archery shoot of 2009. 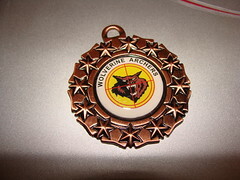 It was a special invitation only shoot hosted by our friends at Wolverines Archers near Stoke. Im guessing there were at least a hundred or so archers there, all the pegs were pretty much full. I ended up shooting in a group comprising of three compound archers and me with my HT recurve and wooden arrows. I don’t have anything against compound archers, in fact I quite enjoy shooting with them it tends to make me more competitive and consequently I concentrate more. An archer shooting with a recurve and wooden arrows is never going to keep up with a compound with carbon arrows, but the fun is actually in trying to keep up with them. Richard always says the same, that trying to keep up with them makes you focus more. That certainly worked for me, at the end of the day I came third in my category and was awarded a bronze medal! I know a lot of the other archers in my category, you get to know everyone since its often the same crowd of people at the same events. Many of them are far more experienced than I am, so I was pretty proud – still am 😉 Everyone in the team cheered me on which was a great feeling! Looks my next shoot is on the 8th of Feb, lets hope I do as well. As always pictures from the day are on my flickr account here. 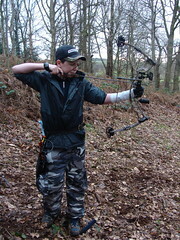 This entry was posted in Uncategorized and tagged archery, Personal by Nadeem. Bookmark the permalink.